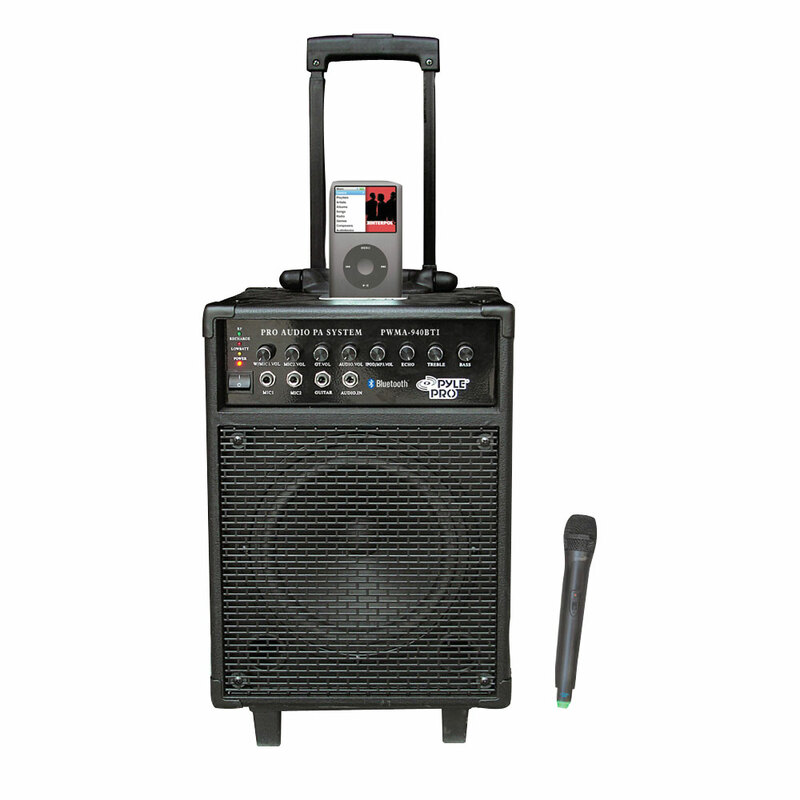 This portable PA system is a mobile entertainment system on wheels, and it's packed with all the latest features for today's modern world. It has an iPod dock connector that charges your iPod and lets you play your favorite music over the powerful 600 watt speaker. It has four ¼' inputs on the front, each with its own volume control, for a total balance of sound. And this unit can be totally wireless - it runs on a rechargeable battery for up to 5 hours of life and includes a handheld wireless mic that works at up to 100 ft. Plus, you can stream Bluetooth audio from your phone or MP3 player! It all plays through our powerful 8' woofer with 3 compression tweeters for a booming low end, rich mids, and sweet highs. Tweak your sound using the bass and treble controls, and apply an effect with the echo knob. The telescoping handle and caster wheels make transportation simple and easy. Includes one 1/4' male to 1/8' female adaptor. Runs on 110 V or 220 V.
Review : Great product! It does everything I need. Great for pool parties and karaoke in the living room. Review : Just received my PylePro PWMA940BTI 600W VHF Wireless Portable PA System with Microphone, 30-pin iPod Dock & Bluetooth. It appears to power on and charge. The RF light comes on when the MIC is turn on. But there is no sound or even hum with volume on maximum. I thought perhaps the MIC was bad so I bought a wired mic to test. The same result with it. Seems like the speaker is not even hooked up. Please advise. Review : So far, so good. Review : Seems to work well and sounds great! Review : I really like the sysytem but the mic stopped working one month after I purchased the system. I am not sure if it was the Mic or the built in wireless reciever. I purchsed another Pyle Mic (differmt mode) with a battery operated wireless terminal to plug into one of the input jacks. That works. Review : Sounds pretty good. Decent volume. Review : If you are looking for a great way to play music in any location, speak or sing over a microphone, use your iPod, iPad, or other Bluetooth device to play your favorite tunes - then is a great option. We use it for all of our music needs in the home and out of the home. It is extremely portable, the battery lasts all day, and it runs wirelessly off of our computer, iPad, iPod, or iPhone. Everyone who sees it is impressed with it's portability, power, and ease of use. If you are considering this for a outside event, picnic, tailgate, or anywhere else that needs a portable music then you will be more than satisfied with this option.